FukushimaVoice: What's really going on in Japan　A letter to inform foreigners of situations in Japan. This letter was written in an attempt to convince school officials to cancel annual school trips to Japan where the students in a public Japanese language immersion program participate in cultural exchanges. I am an osteopathic physician originally from Kyoto. I have been in the US since 1983, attending college and medical school. I am quite fully bilingual in terms of writing and reading. I am currently involved with this site which collects voluntary narrative case reports from those who have symptoms as a result of the Fukushima Dai-ichi accident. I have been spending countless hours gathering and researching information regarding what's really going on in Japan since 311. I had to educate myself in what radiation contamination meant as well as the difference between internal and external radiation exposure. In my medical training, I never received much information about radiation. The Japanese government has been absolutely terrible in how they have managed almost everything since 311. People were not informed of dangers of radiation exposure shortly after 311. As you might recall, it wasn't until May that the government admitted there had been 3 melt-throughs. By then, people had been exposed to radiation. The concept of internal radiation exposure has been suppressed ever since Hiroshima/Nagasaki bombing for political reasons so that atomic weapons development could and would continue. Researchers who studied low-dose radiation contamination had their studies suppressed and unfunded. Organizations such as ICRP (International Commission on Radiological Protection) and IAEA (International Atomic Energy Agency) have gone along with this. Both promote the use of nuclear power. WHO (World Health Organization) has signed something with IAEA so that they would not interfere with IAEA's official announcements. Those researchers whose work was suppressed are mostly represented in ECRR (European Committee on Radiation Risk), whose general position is that there is no safe level of radiation and that hot particles ingested or inhaled cause internal radiation exposure. The general consensus even amongst medical personnel who deals with radiation is that people should not have symptoms unless the radiation levels were much higher than what had been seen in Fukushima. I now know this is because what physicians have been taught was based on ICRP standards. I also know this is inaccurate. The physicians and scientists in Japan are split in deciding what's really harmful to people. However, when you look at who is saying what, you begin to see that those who say high radiation levels are not harmful or people cannot possibly be having symptoms right now have some hidden connections to entities that are pushing nuclear energy. Also, keep in mind how things work in the Japanese society. Those professors and scientists belonging to institutions often do not have freedom to speak their own minds. Thus very few people have been able to speak out the truth to inform the public about what's really going on. So in a nutshell, the government does not really seem to care about the well-being of the people there. Otherwise why would they not evacuate Fukushima children? (I have read that it was because there was not enough money.) It is just insane for children to have to wear dosimeters to attend school. 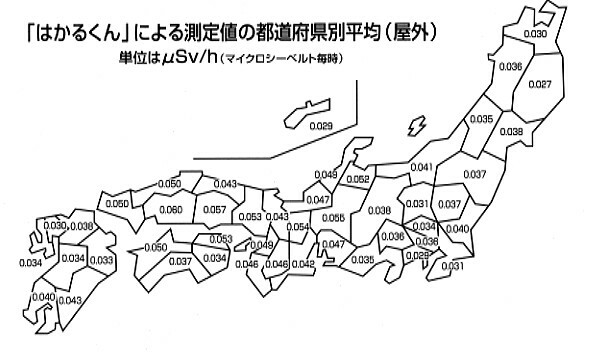 Also, the Japanese government's decisions are based on ICRP findings, so that's why people are still allowed to live in areas of high radiation levels including not only Fukushima but also Kanto regions. The government's standard for radiation levels in food has been set at the level that is reserved for a total nuclear holocaust when nothing would be uncontaminated. That's what has been going on in the last 10 months. FoodChain In Japan, if the radiation level is below the set standard, the food could be declared "uncontaminated" which is technically not true. Our families and friends in Japan are eating contaminated food, most of them unknowingly because they believe what the government says. Those who are more knowledgeable are watching what they eat, choosing food from the western part of Japan. Even then, it's difficult to avoid contamination. In the name of patriotism, consumption of Fukushima products is encouraged and even considered a virtue. Yokohama was one of the cities which had decided early on to "help out" Fukushima by using their products in school lunches. School lunches all over seem to be serving things that should be avoided because they are known to show radioactive contamination early on, such as milk and mushrooms. Hotels and restaurants, and I am sure airline food industry, would tell you that their food is within the safety limits set by the governments. Those limits are simply too high. It's like a Russian roulette. You don't know how much radiation is in what you eat unless you know how much is in each ingredient and prepare meals using such ingredients. This is difficult to accomplish, as ordinary geiger counters cannot measure what's contained in food. In Belarus, there are many regional testing centers where people can take food in for testing before deciding to eat, say, handpicked berries, or homegrown vegetables. There is a few such civilian testing centers in some towns in Japan, but it is not widespread enough for such testing to be a routine daily procedure for everyone. Also, the label on the fresh food that shows where they were made seems to be forged quite often. Rice produced in Fukushima was snatched up at a cheap price by middlemen to be sold to food industry. Same for Fukushima peaches. People in Hokkaido and western parts of Japan might not pay attention to what they eat as they think they are safe because they are far from Fukushima. The aerial and soil levels of radiation may be nearly normal in those places. However, in a country like Japan where goods quickly circulate from one end to another, unknowingly contaminated products are on the shelves all over the country. So in this case distance means very little. You might think a few weeks stay would pose minimal risks, especially when the families and friends seem to be living an ordinary, almost pre-311 life there. I disagree. I can't guarantee this, of course, since nobody really knows what's in the food there anymore, but a few weeks of eating possibly contaminated food could cause enough internal radiation exposure to cause harm. I am not even talking about thyroid cancers and leukemia, although that could certainly happen. Internal radiation contamination means radioactive particles are in the body and remain in the body, emitting radiation at a close proximity to cells and DNA. I have copied an e-mail I sent to someone regarding internal and external radiation exposure at the end. In Belarus, where the Chernobyl accident had a profound effect, only 10 to 20 % of children are born healthy, even 25 years after the accident. This is because the soil there is contaminated and food grown ends up being contaminated. In Belarus, toddlers might die of heart attacks. Premature aging is seen: children are having the type of illnesses you might see in older adults, such as hypertension, diabetes, cataracts, heart diseases, kidney diseases, etc. Sudden deaths are common. Of course congenital deformity and all kinds of cancers are happening. It might be difficult to accept all this information when the most of the country seems to be going about in a usual manner. There has been an increase in sudden deaths which are not covered by media. You can see this blog, which is a partial English translation of Kota Kinoshita's blog. He is a journalist who covered the Tokaimura accident, so he knows about the dangers of radiation contamination, and he has been continuously calling for evacuation of Tokyo and Kanto region. His Japanese blog is here. It's not just sudden deaths. People are definitely having symptoms. I have seen many stories of bloody noses, cough, sore throat, metallic taste(these radioactive materials are basically heavy metals), fever, fatigue, bruises, skin eruptions, headaches, diarrhea, menstrual irregularities, etc., by people from Tokyo and Kanto area. Some of these have also been reported by those who live in the western parts of Japan. Also, I would like to mention the reactor #4 at Fukushima Dai-ichi, which is collapsing. A few more strong earthquakes, and that reactor would go. Already the January 1 earthquake seems to have caused some damage, since radiation levels were high on January 2. 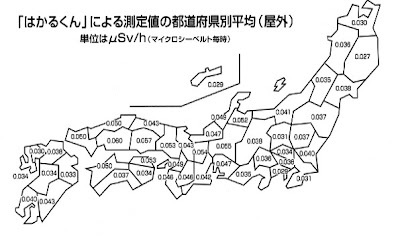 This map shows a natural radiation level in each prefecture prior to 311. 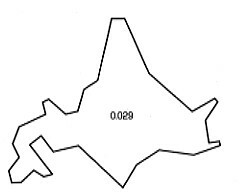 The unit shown is microsievert/hr. It is anticipated that the Japanese government will not tell the truth about the danger, once again, until people have been exposed to radiation. When the reactor #4 collapses, that would be an unprecedented event of nuclear fuel rods totally exposed to the air, which would make Kanto and Tohoku regions uninhabitable and greatly pollute the rest of the world. Please remember that the government's declaration of so-called "cold shutdown" at the end of 2011 was meaningless. Technically speaking, current Fukushima Dai-ichi, with the nuclear fuel melting through the ground, is incapable of being in a state of cold shutdown, as such a process is only attainable when the protection around the fuel is still intact. What they really mean is that the cooling water isn't boiling. However, this would quickly change if there were more damages to the reactors. Those of us who have been closely watching Fukushima Dai-ichi know it's just a matter of time before the reactor #4 collapses in such an earthquake-prone country as Japan. The government will never forewarn the people there so as not to cause panic. Another matter to consider is the incineration of debris which might be radioactively contaminated. The government is trying to spread the debris to all regions of the country. Once again, the legal limits set by the government for the radioactive contamination of debris itself has been raised since before 311. If the debris is contaminated, radioactive material will be released in the incineration process. Tokyo has already begun the incineration, and Indeed people have been reporting increased radiation levels. Now that more people own Geiger counters, some have reported spikes in the middle of the night, when the nearby waste management facility might be incinerating them. So-called filters do not catch all the radioactive material released. This link shows which prefecture has accepted the debris. Lastly, I would like to remind you that the government testing has been limited to iodine and cesium mostly. It is suspected there are more varieties of radioactive material that have been released from Fukushima Dai-ichi. As you might know, plutonium has been detected. If there is cesium, strontium is expected to exist, but testing for strontium is apparently cumbersome and thus not routinely done. This only tells you that you absolutely cannot rely on the "safety standards" set by the government. I am sorry this was a lengthy e-mail, but the fact is there is so much you need to know to fully comprehend the situation there. I almost guarantee that the people in Japan you are communicating with will disagree with what I wrote here, simply because they have no idea what's going on. It is sometimes easier to see the whole picture from the outside. When you are in the midst of this, you are just trying to do daily routine, not having enough time to surf the net for information gathering. Relying on TV and newspaper will not give you correct information. Also, you don't want to admit that your life is about to be drastically changed due to certain unpleasant facts, and I get an impression that many there simply do not want to know. The truth is the Japanese government should have declared national emergency when those reactors exploded. They should not be silently exposing foreign visitors to radiation. Everyone needs to learn what internal radiation exposure means. What you typically hear is that a certain level of radiation is equivalent to a transpacific flight or an X-ray. This entails only the external radiation exposure where rays of radiation pierces through the body, which is what happened to people who were exposed to rays of radiation coming from the atomic bombs. These rays cause breakages in DNA structures. At really high doses, cellular breakages are so severe that people quickly die. So far it is claimed that nobody has died this way from Fukushima Dai-ichi accident, although it is not quite accurate. There are unconfirmed reports of deaths of the workers, such as those 2 workers who stepped in contaminated water in one of the reactor buildings. A human body would try to correct the damage, but sometimes a mistake happens, which leads to genetic mutations of cells, causing cancers. Keep in mind that this can happen not just with radiation but also with other environmental toxins. When cells are bombarded with lots of radiation, the body has no time to repair the damage. Internal radiation exposure is an entirely different matter. This cannot and should not be compared to flights and X-rays. This happens when you inhale or ingest contaminated matter. This actually happened in Hiroshima and Nagasaki, too, but the internal radiation exposure was not acknowledged by authorities for political/military reasons. There was a speech by Dr. Shuntaro Hida, who was a young military doctor in Hiroshima at the time of bombing. He said that the US military told the Japanese government to not acknowledge anybody with who suffered radiation illnesses internally at a lower dose. The United States was trying to develop atomic weapons then, and health consequences from low-dose exposure would be against the international treaty, hindering the weapons development. The video can be seen here. It’s in Japanese. Also another Hiroshima survivor, Dr. Shoji Sawada, has been researching the internal radiation exposure. The Japanese government is going by the standards set by ICRP which is an organization geared towards USING nuclear power. IAEA is also an organization that promotes "safe" use of nuclear power. Their purposes are not people's welfare but the development of nuclear power. Thus the danger of radiation has constantly been underplayed. What happens when you ingest contaminated food or water or inhale contaminated air is that you put radioactive material inside your body. In the first video, Marco Kaltofen talks about hot particles. Once you inhale those, it's really difficult to get rid of from the lung tissues. The radioactive material keeps emitting rays of radiation at zero distance to cells. Cesium mimics potassium chemically. Strontium mimics calcium. Dr. Yury Bandazhevsky, a Belarussian physician, did autopsies on those who died after the Chernobyl accident and found accumulation of radioactive cesium in almost all organs. Because his research was proving the damage caused by internal radiation contamination, he was arrested for false charges and imprisoned for 7 years and deported. He is in exile in Russia. Cesium can accumulate anywhere there are muscles such as heart and uterus, and also affect almost all organs as sodium-potassium pumps are ubiquitous. It's also known to accumulate in pancreas, causing or worsening diabetes. Strontium is taken up by tissues such as bones and teeth that ordinarily take up calcium. Blood cells are formed in the bone marrow, so strontium affects formation of new blood. Strontium and uranium are known to bind DNA, emitting radiation right where the genetic material is. Iodine tablets as radiation pills work by letting thyroid gland take up nonradioactive iodine so that radioactive iodine is not taken up by the body. This only helps with prevention of thyroid cancer. For your information, the Japanese government isn't testing food or soil for strontium as this is extremely difficult. However, if cesium is detected, you just assume there is strontium there, too. It's not just thyroid and other cancers or leukemia which results from radiation contamination. Radiation creates excess free radicals in the body, which in turn go through a chain reaction to cause lipid peroxidation of cells. This destroys cellular membranes of any cells in the body. When the cellular membranes are destroyed, cells lose integrity. Can you see how this would lead to malfunctioning of different types of cells, causing symptoms such as severe nosebleeds, diarrhea, etc.? So the internal radiation exposure can lead to a wide variety of symptoms, but mainly your immune system is over-worked by trying to deal with the insult. Actually we ARE exposed to some radiation all the time, as there is naturally occurring radiation from our geological formation. It has been part of the human evolution. Potassium has a certain percentage of radioisotope that occurs naturally. That's why bananas and seaweeds have some radiation. However, human bodies know what to do with the naturally occurring radiation. Our bodies do not absorb them unnecessarily. Artificial radiation as a result of nuclear fission is a different matter. Radioactive cesium, strontium, plutonium, etc., only come out of nuclear reactors. We actually have radioactive cesium in our soil all over the world not only from the past nuclear testing and bombing and also from nuclear reactors. Theoretically, our body's immune system can handle a little bit of radiation. It would be like you had a mild illness, and if you go and rest the immune system would take care of it. However, if the insult is over the body's threshold, the immune system can't handle it so well. This threshold varies in each individual. That's why some develop symptoms and some don't. Children have lower thresholds. I am told eating contaminated food for a few days might be enough to overload a child's body. Rapidly dividing cells as in developing fetuses and children won't have time to repair the damage to DNA before dividing. This leads to higher likelihood for genetic mutations. These genetic mutations are not only permanent but passed onto their offspring 100%, defying the usual Mendel’s law of genetic transmissions. I still spend several hours each day looking through some blogs and twitter logs, and I have seen many reports of sudden deaths in teens up to the elderly. There is no way to confirm that those deaths are from radiation, but when many people begin to report more sudden deaths amongst their families and friends, you wonder why. Cardiac arrests, arrhythmia, and brain hemorrhages are being reported as causes of such sudden deaths. There were lots of mycoplasma pneumonia, persistent cough, hemorrhagic conjunctivitis, and bacterial meningitis reported in those who were ill. It is commonly believed amongst health care professionals that deal with radiation that at "low-dose" of radiation such as what's been detected in Tokyo, people should not have any symptoms. Well, the danger of radiation is so underplayed that the health care professionals have been given incorrect information. Otherwise they won't be able to use all the medical and dental X-rays. It’s not just thyroid cancer and leukemia that might result from radiation exposure. I have seen many stories of bloody noses, cough, sore throat, metallic taste (these radioactive materials are basically heavy metals), fever, fatigue, bruises, skin eruptions, headaches, diarrhea, chest pain, irregular heartbeat, menstrual irregularities, etc., by people from Tokyo and Kanto area. Those who report the symptoms to doctors are ridiculed because they should not have any symptoms at the radiation levels they experienced. Doctors in Japan, with an exception of a handful of brave doctors, do not have freedom to diagnose radiation-related illnesses unless the Ministry of Health creates a policy permitting it. Apparently in the socialized medicine they have in Japan, the doctors have to follow the government policy or they will lose their medical licenses. Just because people live far away from Fukushima and Kanto area, they are not free from any effects. Because the radioactive material has fallen on the ground, a caution should be taken to prevent any contamination through genital area. This means not sitting on benches, ground, or grasses. It means wearing sanitary napkins all the time to prevent genital contact with any radiation contamination. By the way, there are some brands of sanitary napkins and diapers produced in factories in Fukushima which registered high radiation levels. If you confer with prospective host families or school officials about these matters, they might tell you that you are over-reacting. They just don't know. A majority of the Japanese have no idea they are facing a nightmare of internal radiation contamination. They likely will not realize it until they begin to experience physical issues. By then it's too late. They might have actually experienced vague symptoms, but they might not have connected them with radiation exposure since the government has wrongly "assured" them everything was okay. Do you remember when H1N1 flu was going around a few years ago? That summer many Japanese groups cancelled their trips here even though there was no reason to. This would be the opposite of that, in a way, except this time the problem is way more serious and less obvious. You can't just do a flu test in this case. I believe if it was the US having the radiation issues Japan is having, the Japanese would cancel the trip instantly. I think certain risks are inherent in life, and you have to still live your life despite it. You can't just sit at home because you are afraid of car accidents, earthquakes, etc., but no matter what you decide, you should be able to make an informed decision. You need to have correct knowledge of what you are dealing with. Radiation is no joke. You cannot beat the internal radiation contamination. The best prevention is avoidance. Thankyou so much for taking the time and effort to share this with the people of the world. Governments everywhere play everything down and the people walk blind, we need to speak out and protect fellow man and not fear the Governments. Thank you for posting news about Fukushima and radiation contamination in Japan. I'm a Japanese living in the U.S. I was wondering about what's going on in Fukushima lately because we hardly hear anything about it. Because of my concerns for my families and friends living in Japan, I started surfing the net and found a Japanese blog that posts the radiation levels in the foods. I was stunned to see the radiation contamination in rice, flour, ice cream, mushrooms, etc., that are sold in stores. More I did the research, more angry I get toward Japanese government and Tepco. I can't believe what is going on over there. They seemed like they changed (raised) the maximum radiation levels in food so that it is legal to sell those contaminated food. The Japanese government hasn't and is not planning to evacuate people, especially kids, who are still living in the highly radiated area. The below video is the meeting held between the Japanese officials and Fukushima people. Those officials seem cold blooded. I got so angry and sad.